Want a stunning summer glow without bronzer? It’s easier than you think. 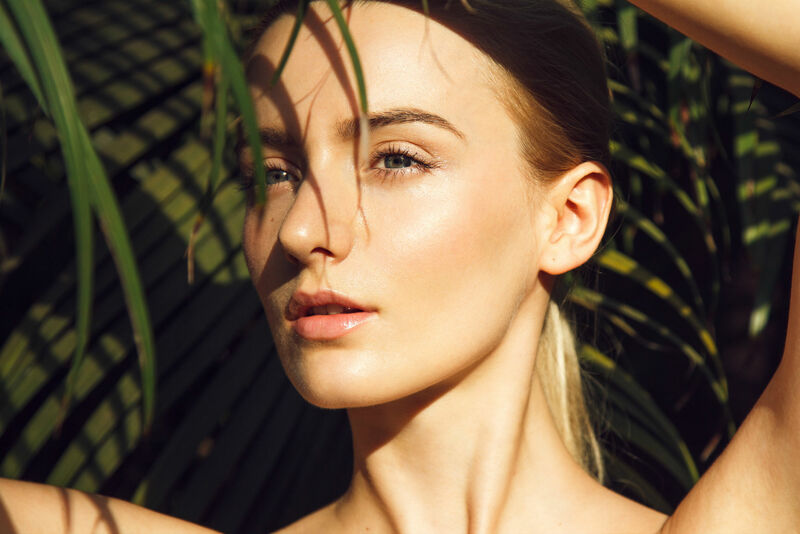 While many women turn to makeup to achieve a flawless finish, there are other great options out there that can help you achieve a dewy skin that looks healthy, luminous and glowing. Remember that when your skin is naturally healthy, you don’t need to cover it up with makeup. Keep reading to learn how you can ditch your makeup and get dewy, glowing skin. Have you ever noticed that exercising creates natural color that brightens your face? This is because a good workout helps drain toxins from your skin by stimulating your lymph glands. Don’t have time to exercise? Try a facial massage. Clarifying Facial is a combination of Microdermabrasion (an exfoliation procedure), extractions, mask and massage to cleanse your skin by removing blackheads and other impurities that blocks your pores giving you healthy and glowing skin. You’ve probably heard the saying ‘you are what you eat.’ Well, it’s true. Your diet plays a major role in your skin health. By cutting out poor food choices you can help create brighter, more luminous skin. Start by cutting down on caffeine, alcohol, and high-sugar foods and beverages. Replace them with good food choices, like fresh fruits, veggies, and whole grains. If other methods are not working, try Pearl. The Cutera Pearl Procedure uses FDA-cleared resurfacing laser to treat age spots and sun-damaged skin as well as common skin problems, such as wrinkles, freckles, scars, and uneven skin textures giving your skin a healthy, pearl-like glow. During the procedure, the top layer of skin is treated with pulses of light in a pre-selected pattern. The laser simultaneously sends heat to the deeper layers of skin to provide longer-term benefits. In less than a week, you will notice overall skin clarity, smoothness and softness. Some studies have shown that maintaining a diet high in beta-carotenes can help create a glow-like effect on your skin. This red-orange pigment can be found in a wide variety of delicious and healthy foods, such as mangoes, apricots, carrots, and papaya. If dull or dead skin is preventing you from achieving a dewy, glow, consider a chemical peel. Chemical peels work by gently removing the outer superficial layer of skin while stimulating new collagen and cell growth production. At the Cutis Laser Clinics, we offer several types of chemical peels. Cutis Anti-Acne Peel helps to reduce acne by unclogging the pores while Cutis Crystal Peel improves the skin tone by lightening freckles, age spots and other pigmentation. Having enlarged pores can make your skin look rough and sometimes oily. Visible pores often develop when these tiny holes become clogged with oil, dirt, and dead skin cells. In time, clogged pores can also result in blackheads and whiteheads. Laser Genesis utilizes FDA-cleared non-invasive laser technology to safely, discretely and effectively treat large pores as well as fine line wrinkles, uneven skin texture, diffuse redness and scars. In clinical studies, Laser Genesis was proven to stimulate collagen growth giving your skin a youthful glow. You don’t need to cake on the makeup to achieve dewy, glowing skin. Banish common skin problems by choosing the right skin care products and treatments. To learn how you can get a dewy and healthy complexion, contact Cutis Laser Clinics in Singapore and schedule a consultation with our aesthetic doctor, Dr. Sylvia.